Hot Deal on Philosophy at Rue La La! If you managed to get the $20 credit to Rue La La, here’s another great way to spend it! Hurry on over to Rue La La and check out the Philosophy sale. The credit can be applied to shipping and there are several Philosophy items below $20. These are the items that are going to sell out quickly. If you didn’t get the $20 credit, you can still take advantage of this sale by signing up for Rue La La. It’s free and they have awesome deals! Daily deals Apr 30, 2011 in free, RueLaLa · Expired! American Girl Sale Today on Rue La La! Did you get the RueLaLa $20 credit last week? If so, get ready for an awesome sale starting at 8:00 am PST. today on American Girl dolls & accessories. Head over to Rue La La and check out the American Girl sale. They’ll have American Girl mini dolls, doll & girl outfits, and accessories. American Girl is fairly high priced so I’m sure this deal is going to sell out very quickly. Daily deals Apr 28, 2011 in RueLaLa · Expired! 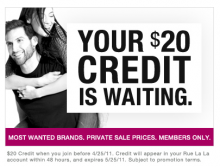 Hurry over to Rue La La and get $20 credit for all new account sign ups! Rue La La is another great deals site, it’s free to sign up! They have great sales with merchandise a lot less than $20. This offer is only good through today April 25th. Your credit will not apply instantly, it takes a little while to show up. Also, don’t forget to invite your friends to join Rue La La. You will get a $10 Rue La La Credit when they place their first order. Daily deals Apr 25, 2011 in RueLaLa · Expired!